The five-nation grouping agrees to consider a simplified business visa regime and easier customs procedures. The New Development Bank plans a unique approach towards lending. India Prime Minister Narendra Modi called on the country’s BRICS partners to facilitate trade and reduce customs barriers that are in place at the moment. Addressing the BRICS Business Council, at the 7th annual BRICS summit in Ufa, Modi said India expected to sign an intra-BRICS customs agreement to facilitate trade. The BRICS Business Council, which is composed of 25 prominent entrepreneurs from Brazil, Russia, India, China and South Africa, represents various industries and sectors in the grouping. Its members spoke of difficulties in obtaining visas and said this was among the barriers to greater trade within the grouping. South African President Jacob Zuma told the council that the country supported measures to facilitate visas for businesspeople. He said South Africa unilaterally initiated such measures last year. South Africa suggested that a BRICS business pass be developed on the lines of the APEC Business Travel Card, where a holder does not need a visa to visit an APEC member country. Brazil is the only BRICS member that follows a strictly reciprocal visa policy. India’s new electronic visa system simplifies the entry procedure for casual business visitors and tourists. Citizens from all of India’s BRICS peers can use the facility to obtain a one-month visa twice in a calendar year. Bureaucracy pertaining to customs procedures, however, remains a common complaint among each BRICS member. Customs procedures should reduce on initiatives such as a free trade agreement between the Eurasian Economic Union and India, however they do not provide a common solution for the BRICS grouping as a whole. Russia proposed a roadmap for investment cooperation with the BRICS. "We have consulted with our businesses, and have included about 50 projects and initiatives, including the establishment of an energy association, the creation of an international energy research centre, as well as founding an industry union,” Vladimir Putin said at the plenary session. Thanking Putin for hosting the summit in Ufa this year, Modi came up with a series of ideas to improve cooperation within the BRICS. 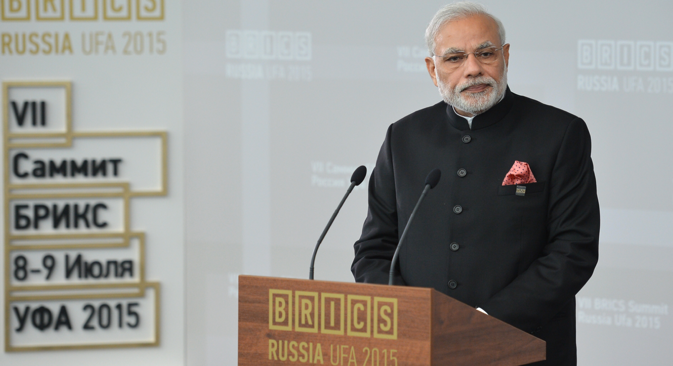 At the plenary session, Modi called for cooperation in renewable energy and the development of digital technologies. He also said there should be greater interaction between states and provinces in BRICS member countries and a common approach towards meeting food and water shortages. He also said the members should organize sporting events, adding that India could host a BRICS football tournament. “We should also cooperate in film production,” Modi said, emphasizing the fact that films are an important part of the culture of each of the BRICS countries. The Indian Prime Minister also raised the issue of international terrorism. “We should speak in one voice, without distinction and discrimination between groups and countries, sponsors and targets,” Modi said. These comments should be looked upon within the context of the Shanghai Cooperation Organization (SCO) summit that will be held on July 10. The SCO will initiate the measures to make India and Pakistan permanent members of the security grouping. Modi’s remarks may have also been targeted at his Pakistani counterpart Nawaz Sharif. The two are scheduled to hold a meeting in Ufa. Senior bankers from Russia and India said the New Development Bank, which held its inaugural meeting before the BRICS summit, would continue to expand, but would not position itself as a rival to existing multilateral lending institutions. Dmitriev said one of the goals of creating the New Development Bank (NDB) was to create a mechanism that would allow Russia to finance joint projects in local currencies. NDB President K.V. Kamath said the bank would have a different approach towards lending, where it places a priority on the borrowers' interest instead of the lender’s interests. The BRICS countries have a combined population of almost 3 billion people. Their total GDP is around $16 trillion. While the international media carried several reports over the last few years about BRICS expansion with countries as diverse as Indonesia, Argentina and Egypt being mentioned as potential candidates, the grouping has decided not to expand at the moment. Russian Deputy Foreign Minister Sergei Ryabkov told reporters that the BRICS grouping was in no hurry to expand, but new members may be welcomed in the future. “BRICS is not an organization, it is a collection of countries that are united by national interests,” Rybakov said, according to Sputnik News.